I take my time on the winding asphalt that makes up the roads that bring me back to where I came from. I tick off their numbers as I come to intersections: 100 to 309, 309 to 54, 54 to 61, 61 to 42. Each part of the journey is specifically marked with vistas, with the scars of industry, with the richness of the Appalachian mountains. I take my time because change here is slow and subtle, does not smack one in the face with abruptness. There is no sense of urgency to the time I spend here. 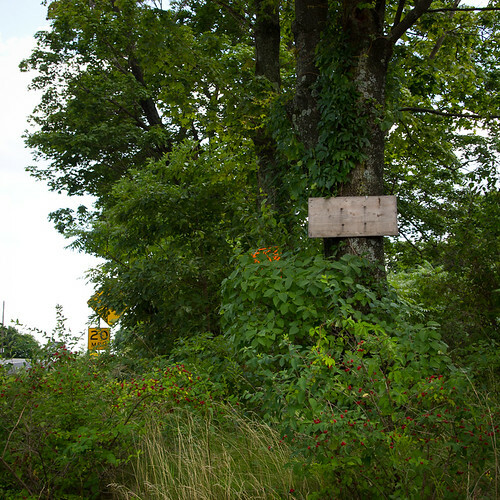 Then it is no wonder I was having trouble ignoring the new signs in Centralia. 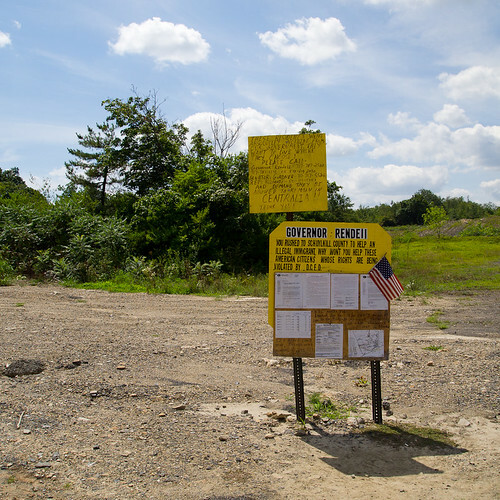 It is really hard to drive past the big yellow sign, an open letter to Governor Rendell, posted near the fire site. 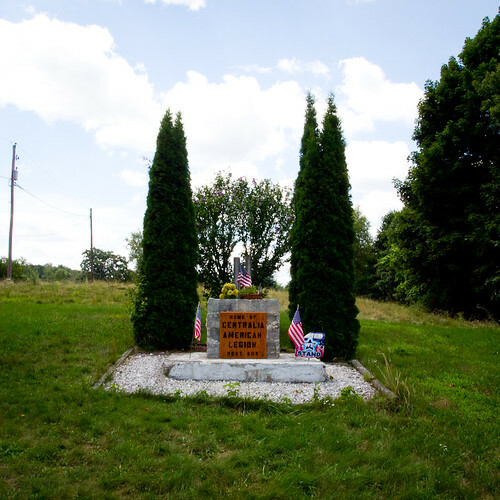 It is glaring and demanding when viewed in passing from route 61. With a flick of my wrist and my left turn signal, I abruptly make time to make some pictures because I don’t really have anywhere I need to be. When I turn off of 61 to do an about face, I have a hard time ignoring how overgrown things are and that another house has been torn down; its foundation gone, earth smoothed over, thick weeds grown over where it once stood, existence utterly eliminated. There are a lot of people wondering around; all visitors, rarely residents. 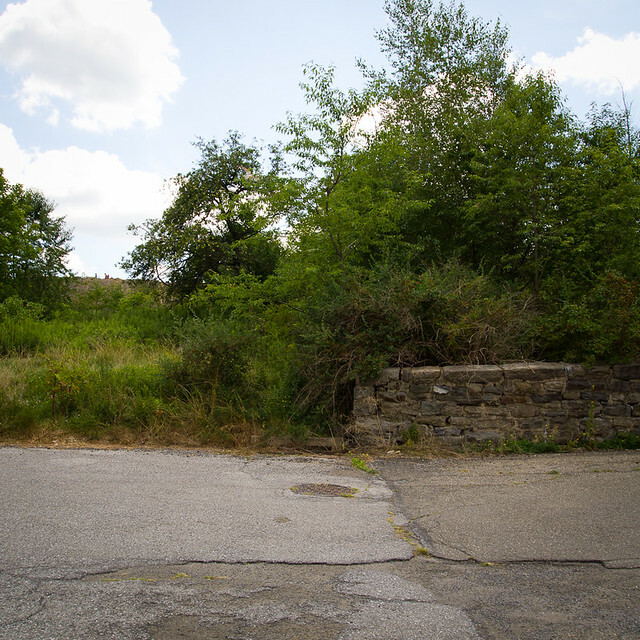 Centralia is infamous and alluring, its legend strange and sad. 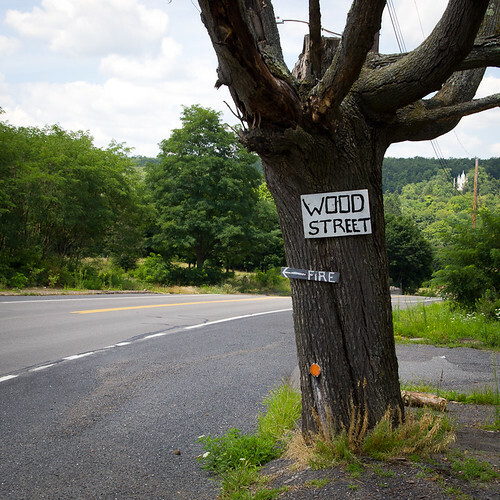 I see a surprisingly large number out of state plates and when a young couple in a new, red Volkswagen with Massachusetts plates stops to ask me “Is this really Centralia?”, I give no pause and answer in speech that is my native Pennsylvanian vernacular; words shortened, syllables dropped and vowels with a strange lilt. The cracking streets of Centralia are hot under the soles of my sandals and the breeze doesn’t do much to cool my skin. Sweat beads on my upper lip as I walk quickly across the expanse of route 61. I am squinting into my camera’s view finder when I am cat called by a group of teenage boys that whiz by me in a white Jeep. I think about cold water and the cantaloupe slices waiting for me in the car, about all of things I have read and have written about Centralia, about how this place will look in 2 months or 5 years or 10 years from now. I wonder what changes will come to this town, hushed and slow, and what happens when the last house is taken away and torn down. as for the story, not sure what it is. but wow, I feel like I need to go there now.